The Society was most pleased to welcome MARIENNE FAULL to the Members Meeting on 11th July. Marienne is a member of Pyree Family History, Nowra where she is Senior Vice President, Secretary and Research Officer. 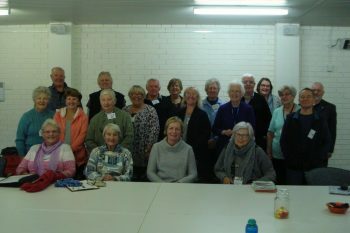 Her knowledge of the local area is extensive and her presentation of the Shipping Industry of the Shoalhaven was excellent, enjoyed by a large gathering of our members. The topic began with the importance of the Shoalhaven River and its use in the early days. Ship building, the punts and forest wood which was readily available, along with the men of the industry made for a most informative subject. We learnt of the digging/dredging of a passage through to create the ‘Berry Canal’ that allowed for easy transportation. Marienne has some wonderful visuals of the boats, boat builders and mentioned the important pioneers of the area. The afternoon concluded with a cup of tea and a great table of goodies provided by Suzanne and Lynn.